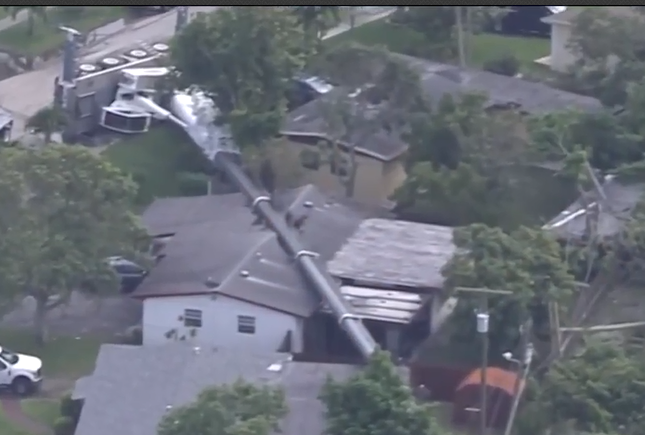 A crane toppled on two houses in a South Florida neighborhood, smashing through the roof of one of the homes and injuring at least two people Wednesday, authorities said. 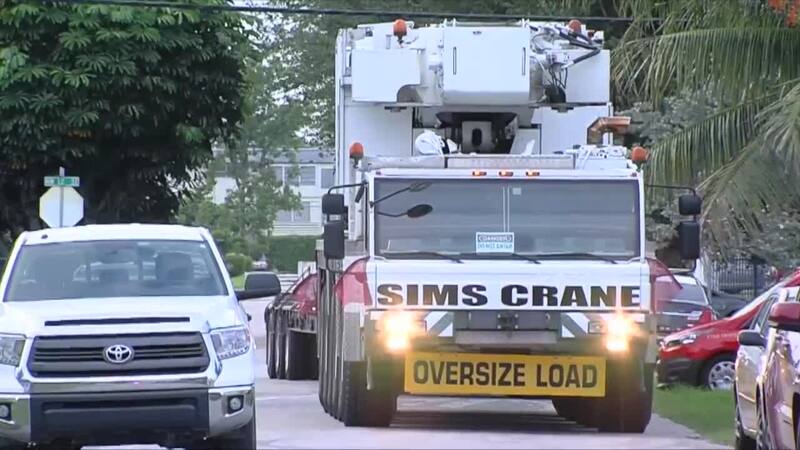 The crane was being used to put up Florida Power & Light electric poles when it fell on the houses, Lauderhill Fire Rescue Asst. Fire Chief Jeff Levy said at a news conference at the scene. "There's significant roof and structural damage to the one house and some roof damage to the second house," Levy said. Power also was knocked out in the surrounding area. No fatalities or serious injuries were reported. The crane's operator was treated for minor injuries at the scene, Levy said, while a man who had been inside the home with the collapsed roof was taken to a nearby hospital. The resident had been alert and walking around before his trip to the hospital. "He's lucky to be alive," Levy said. A Broward Sheriff Fire Rescue dog searched area homes for other victims, but none were found, Levy added. It wasn't immediately clear what caused the collapse, Levy said. It remained under investigation. 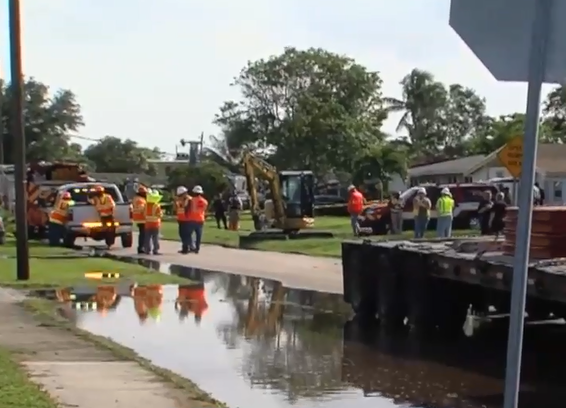 FPL spokesman Richard Beltran confirmed the crane was being operated by a contractor when it tipped over, but he couldn't provide additional information. Lauderhill is located northwest of Fort Lauderdale in South Florida. 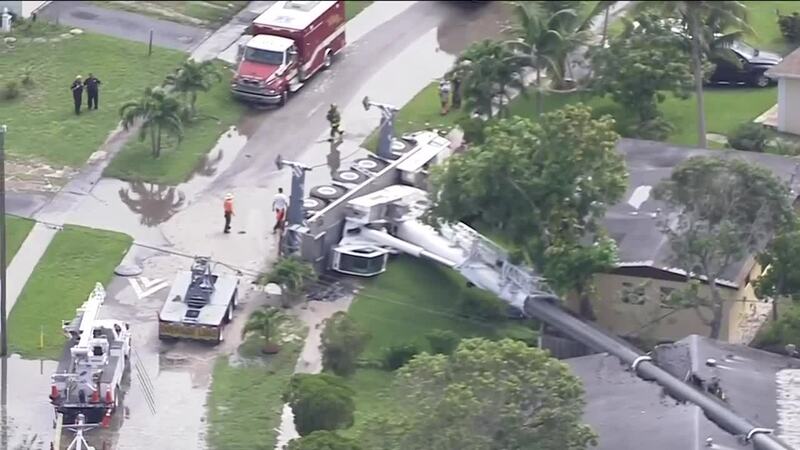 The Lauderhill Fire Rescue Department tweeted photos showing its emergency crews on the scene amid views of the crane toppled atop a house and a fence.